It’s often difficult for imaging professionals to find high-quality dye sublimation printing fabrics and banner material because many suppliers only handle media for solvent, eco-solvent, UV and/or Latex printers. As the leading innovative developer and supplier in the printable media industry for over 25 years, Ultraflex Systems has an unmatched selection of PVC and specialty substrates that are ideal for use with a variety of digital printing equipment and processes including dye transfer and direct dye sublimation. Ultraflex Systems product lines include Front-Lit Media, Back-lit Media, Mesh Banner Material, Specialty Materials, Floorscapes and more. 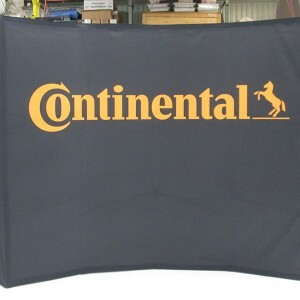 VorTex Flag D110 is compatible with dye transfer, Latex and UV printing equipment. The wind flow and exceptional bleed through characteristics make this the perfect media for pole banner, flag and theatrical applications. Additionally, UltraCanvas Backlit D280 is a backlit textile with less than 1% shrinkage and an anti-static coating that produces incredible back-lit images. Other exceptional products include our UltraPoplin Soft Image D240, which is certified for HP Latex Ink and printable with Latex, UV, direct dispersion and transfer dye sublimation equipment and is a 100% recyclable material ideal for use on projects in the USA, England, Scotland, Mexico, Canada or elsewhere that specify environmentally friendly products. Further, VorTex Super Stretch D231 and VorTex Stretch D229 dye sublimation printing fabrics are often the best choices for pop-up displays and tradeshow exhibits requiring stretchable media. Ultraflex Systems media specialists provide technical data and media selection assistance to industry professionals worldwide. Contact us today to learn more.